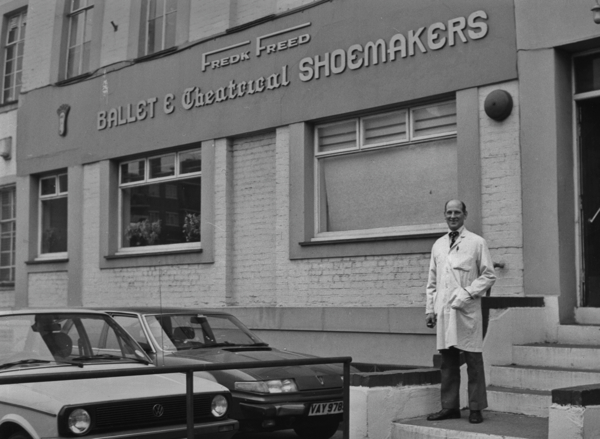 The shoes worn by the world’s leading ballerinas are made in Hackney by Freed of London the pre-eminent shoemaker to the theatrical profession, producing more than one hundred and fifty thousand pairs a year to supply companies scattered around the globe. As you catch sight of the nondescript frontage of Freed of London’s factory in Well St, going past on the bus, you might not think twice about what lies inside. 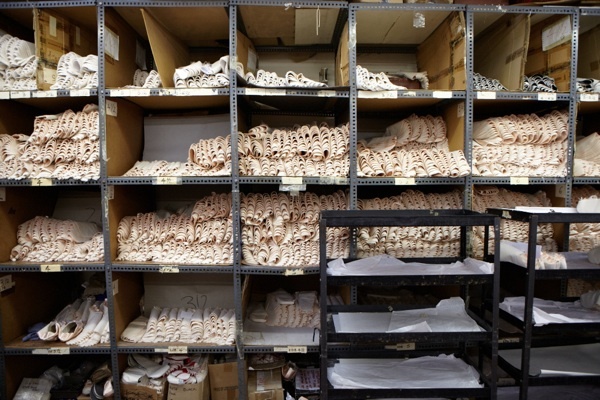 Yet there is a certain point within the building where you turn a corner and confront a breathtaking vision of more pink satin shoes than you ever dreamed of, piled up in various stages of manufacture. In the shimmering blend of daylight filtering through the skylights and the glow of the fluorescent tubes, the lustrous satin glistens with a radiant life of its own as if you were gazing upon seashells lit by sunlight refracted through crystal Caribbean waters. 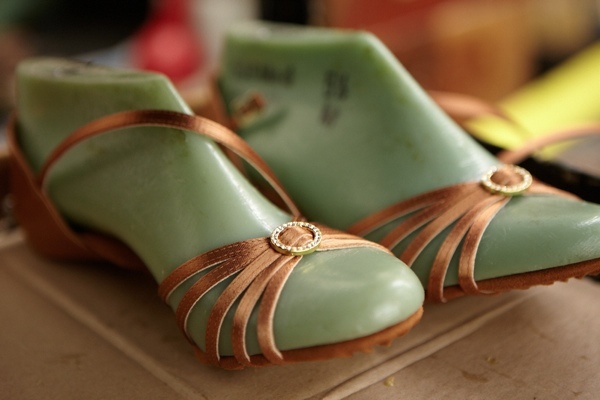 Even before they reach the dancers, the magic of the shoemakers’ art has imbued these shoes with a certain living charge just waiting to be released. 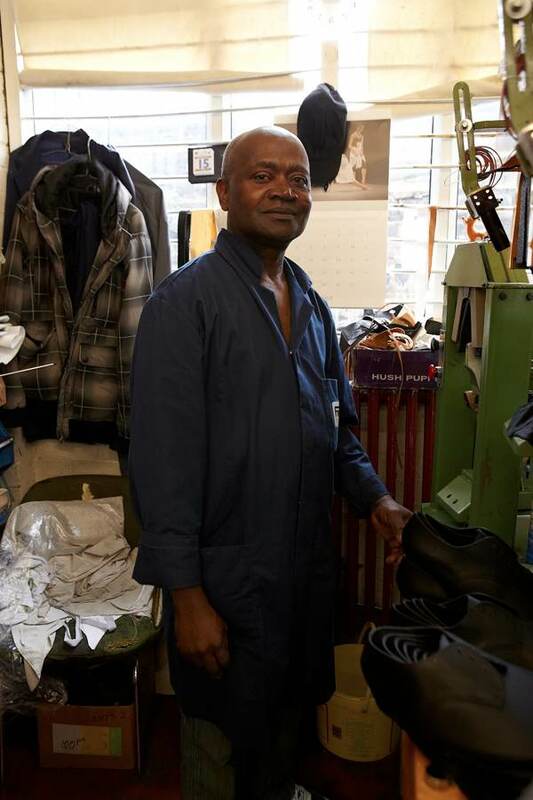 Until the eighties, Hackney was the centre of shoe manufacture in London with Cordwainers’ College training students in the necessary skills to work in the local factories. But the college and almost all the factories have gone, except Freed. 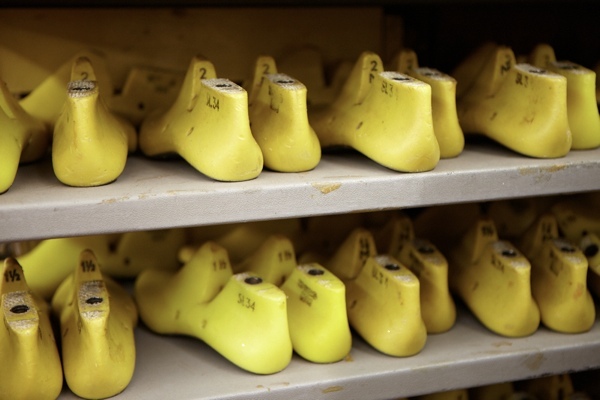 Yet the most talented veterans gravitated to Freed and when Contributing Photographer Patricia Niven & I visited them, we encountered a proud workforce who are collectively responsible for the phenomenal success of Freed as the world’s leading maker of ballet and theatrical shoes. 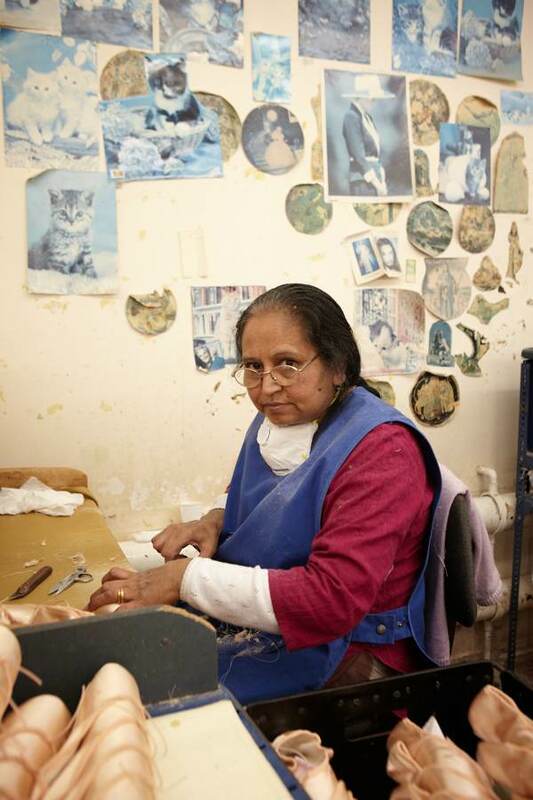 We started in the Theatrical Department where shoes for musical theatre are made, overseen by Supervisor Ozel Ahmed who has worked here twenty years. 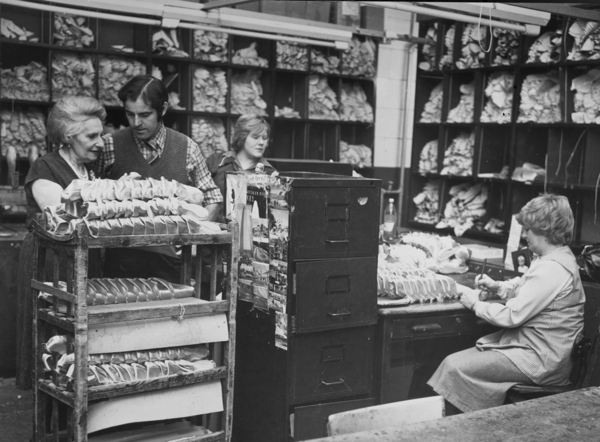 At one end, designer and pattern cutter Jimmy Fenn worked in his cabin designing, next to the clickers who cut out the leather – and beyond them were a handful of people sitting at machines, sewing the pieces together with meticulous attention to detail. Ozel explained they only made five to seven hundred pairs of shoes a week in her department, as opposed to the three to four thousand which would get manufactured by the same number of people producing shoes for the fashion market. And then she took one of those shiny, strappy, diamanted confections that are barely-there, for which she is responsible, and bent it in half to show how soft and flexible it was. The shoe was a discreet masterpiece of elegant structure and subtly judged tension, strongly manufactured to suit the needs of a dancer performing nightly in musical theatre. 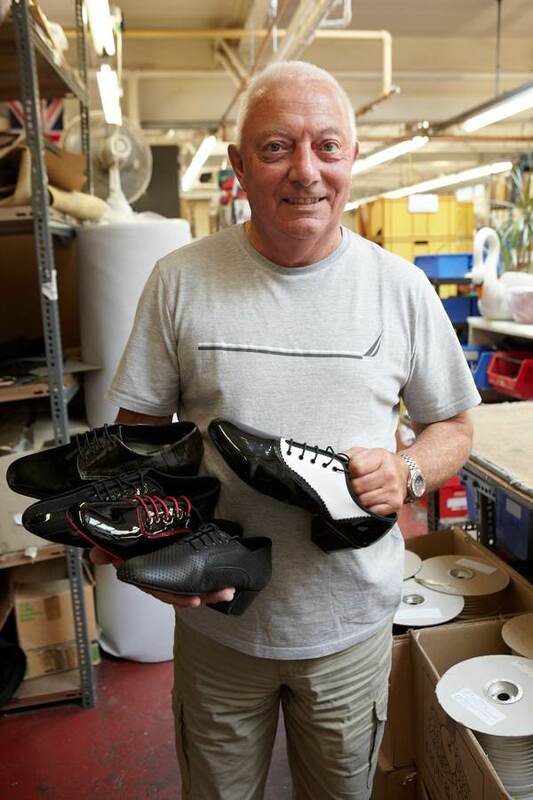 “There is no single West End show without a pair of our shoes,” Ozel assured me confidently. Next door in the Lasting Room where the different elements were assembled to complete the shoe, large machines dominated yet there were also plenty of people in evidence with pots and brushes, applying glue strategically. 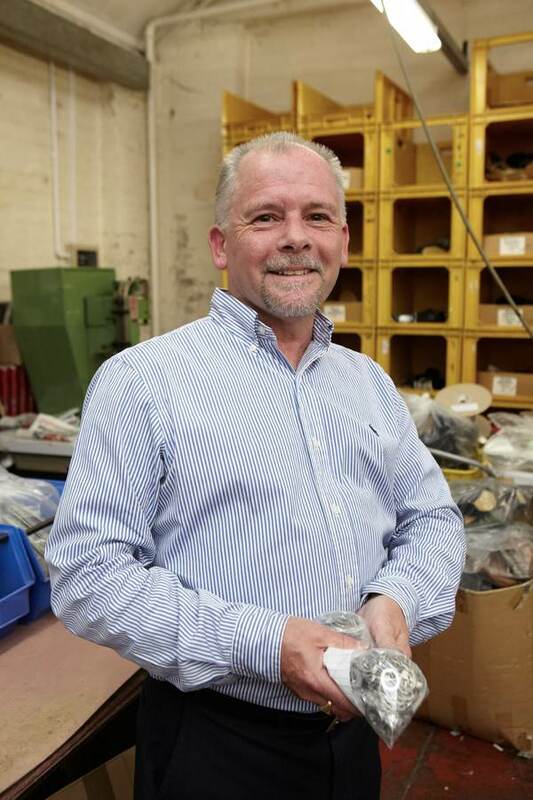 “Everyone in this room, you’re talking a minimum of thirty years’ experience,” revealed Ronny Taylor, the Lasting Room Foreman. Gazing around this room, there was a startling contrast between the battered industrial equipment and the perfectly glossy delicate little shoes, and I was fascinated by the long line of distinctive skills each applied to different aspects of the construction of them. 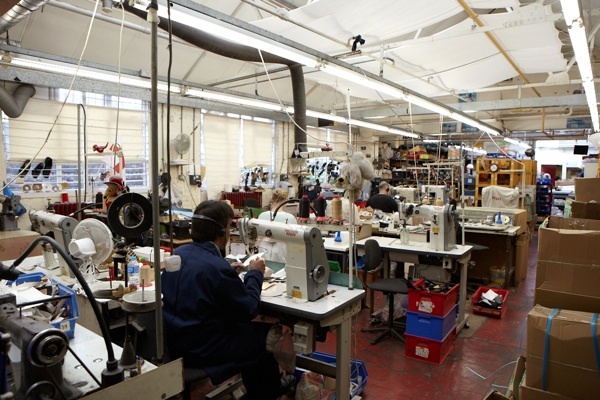 The nature of the specialised production process at Freed of London means that the contribution of every member of the team is crucial to the success of the company. 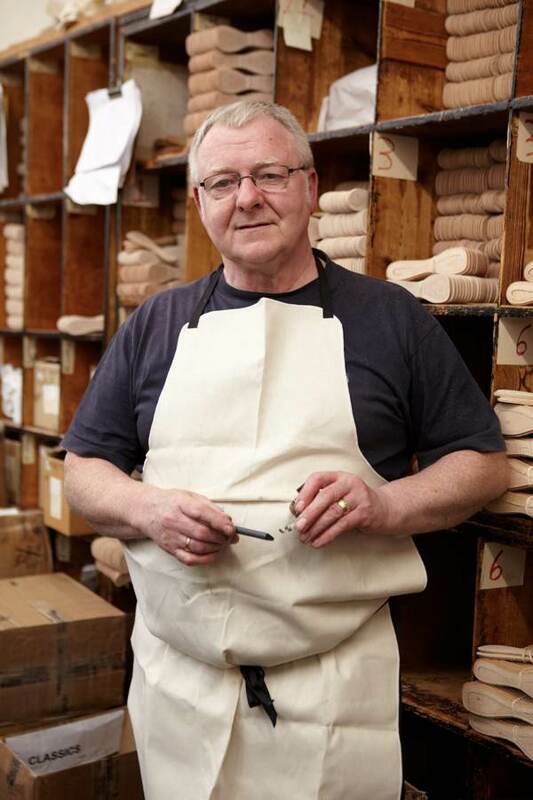 It is a rare place where skills and old trades are prized, and wedded happily to the glamour of show business, ensuring that the artistry of the shoemakers of Hackney earns applause on stages throughout the world. The theatrical shoe department at Freed. Shoe lasts numbered with sizes. Four thousand pounds of pressure is exerted to join the sole to the shoe. 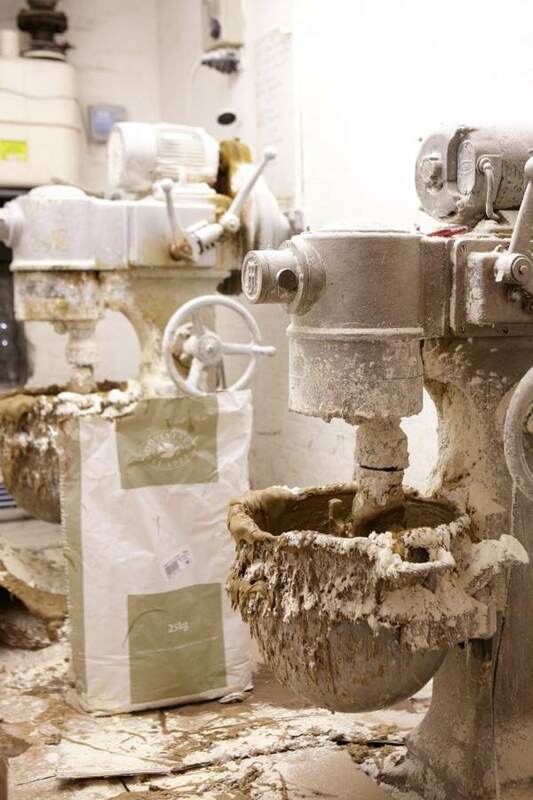 Once a week, flour and water is mixed to make the paste used to create the blocks for pointe shoes. A little insecticide is included in the blend to prevent weevils eating the shoes. Satin and calico blanks at the start of the manufacturing process. 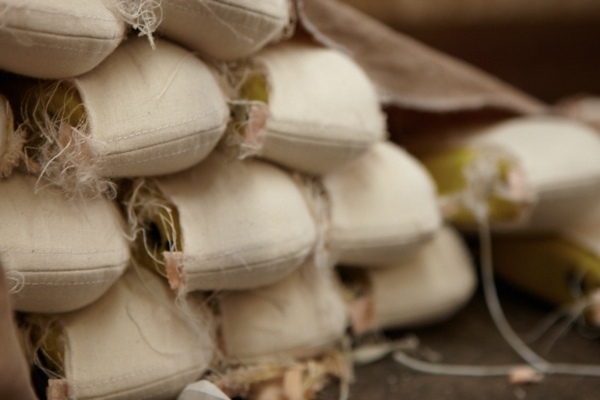 Ballet shoes are manufactured inside-out and then turned upon completion. 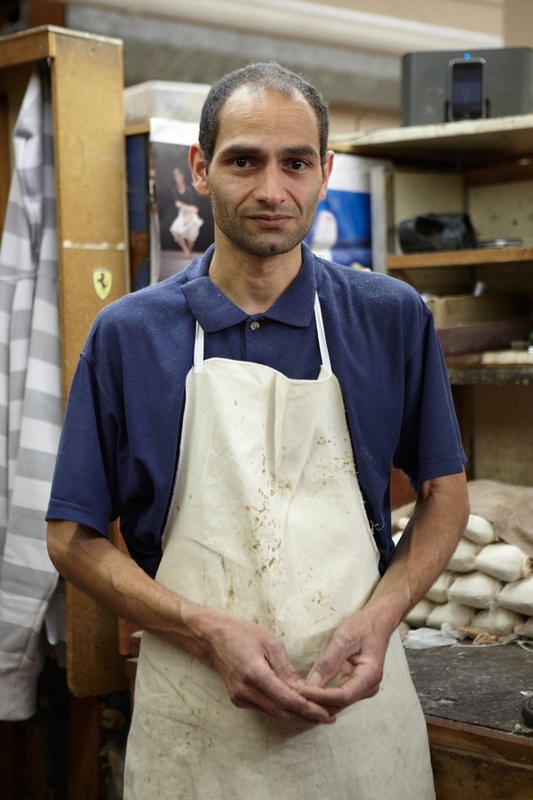 “Crown” has ballerinas who have been his exclusive customers for twenty-four years. 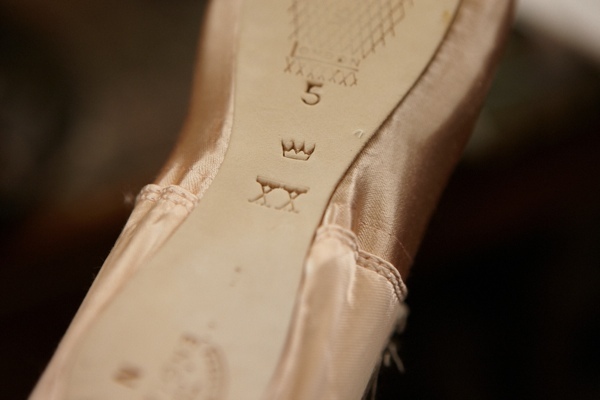 The maker’s mark of “Crown” upon the sole of one of his pointe-shoes. Pointe shoes are baked overnight in the oven to dry out the flour glue. 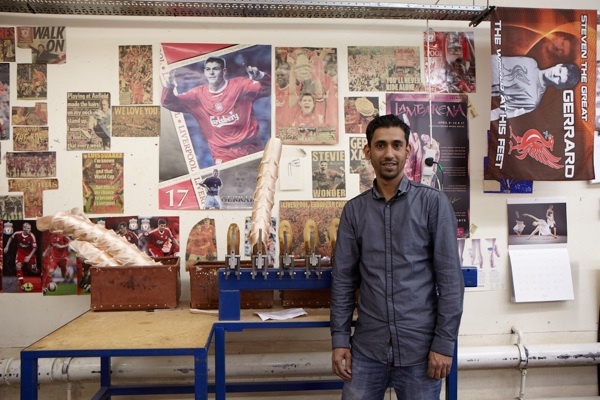 Luthu Miah, Supervisor of the Binding Room. 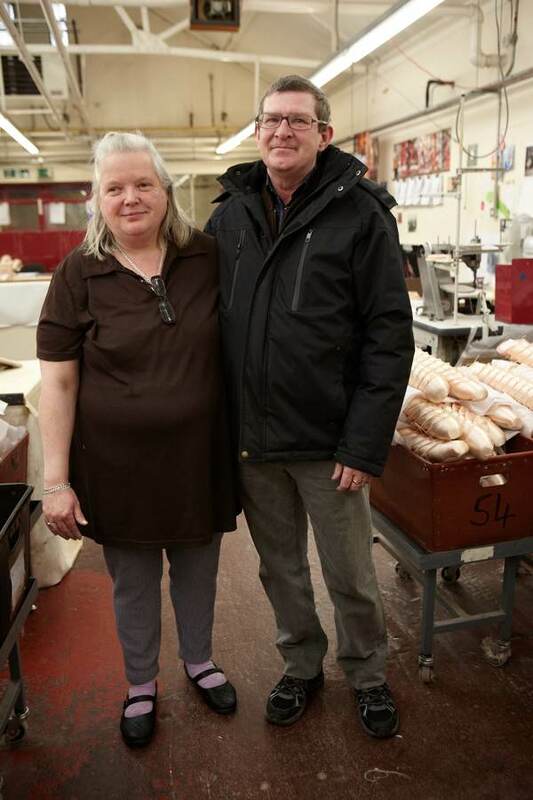 Sheila (Pointe Shoe Finisher) & Philip Goodman (Chargehand) met on their first day work at Freed, forty years ago, and have been together ever since. 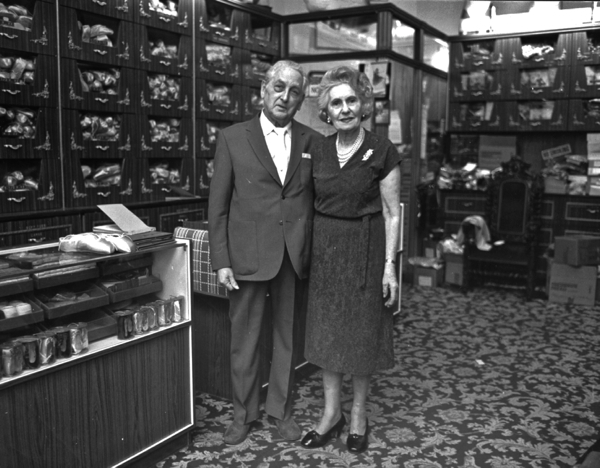 Frederick Freed and his wife Dora who founded Freed in 1920. 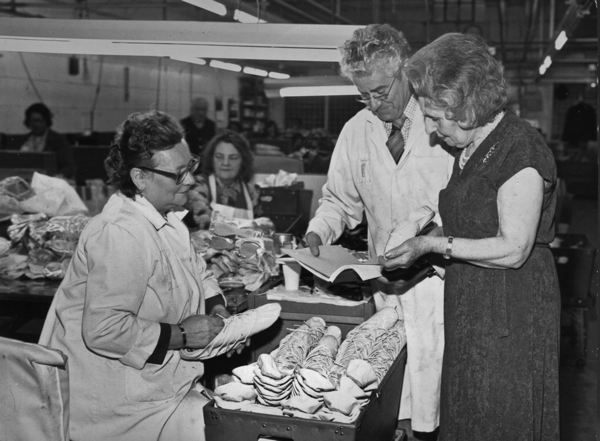 Dora in the factory in the seventies. 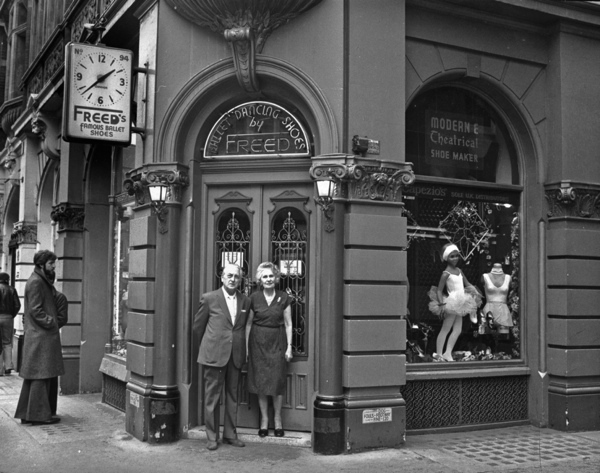 Frederick & Dora Freed outside their shop in St Martin’s Lane. After the workers have left and the lights are switched out, the shoes lie waiting …. What a fascinating and heartwarming piece – long may they continue. Thank you, Gentle Author. Fantastic! I loved the article. A pointe shoe has a short life as well, after 20 hours of dancing they need to be replaced. In professional companies dancers wear a new pair for every performance. And pointe shoes are also noisy. The shoes look dainty but they are are actually quite hard and if there was no orchestra the audience would hear the thumping sounds of the dancers feet hitting the floor. Also the ribbons and elastics are not attached in the factory, but are sewn on by hand, each dancer does her own. 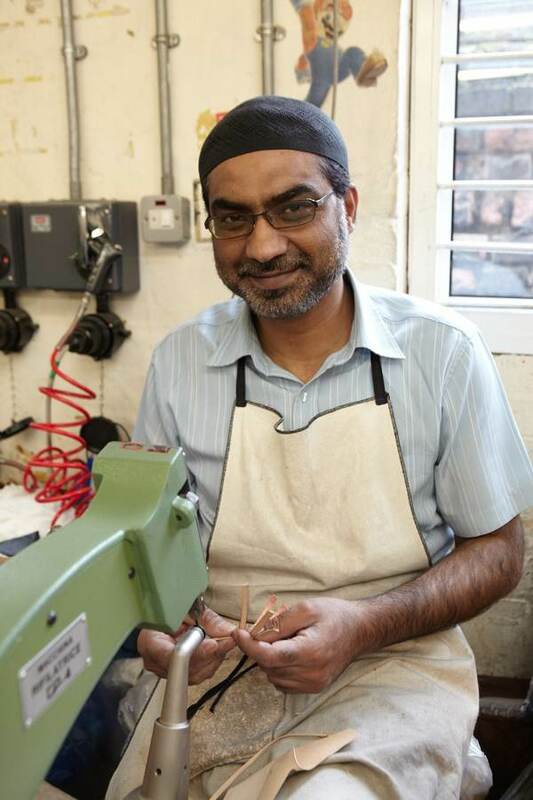 dedicated professionals are behind those seemingly-delicate shoes……making the magic possible. Thanks GA — You take us to the most amazing places, and introduce us to great folks. Oh, my, what an utterly lovely story, especially in these crazy B***** weeks. Thank you, Gentle Author, and thank you, Freed of London.. 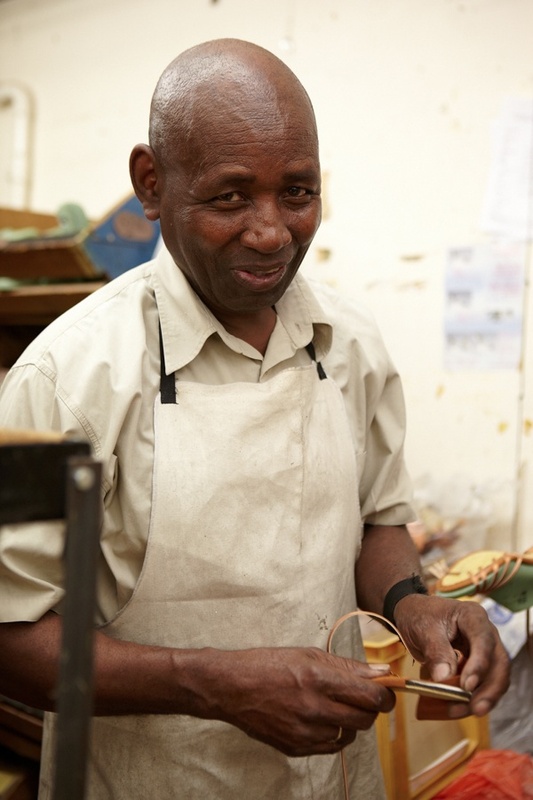 Wonderful to see such marvelous craftsmanship and care taken over these beautiful shoes by such amazing people.